In 2009, Congress designated certain reaches of the Amargosa River in Inyo County, California between the town of Shoshone and Dumont Dunes as a Wild and Scenic River. 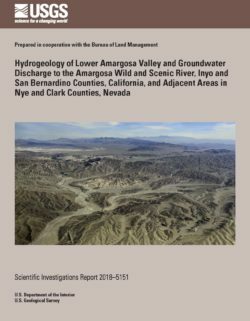 As part of the management of the Amargosa Wild and Scenic River, the Bureau of Land Management cooperated with the U.S. Geological Survey to assess the surface and groundwater resources of the Tecopa basin. Groundwater is the primary source of water to the perennial reaches of the Amargosa River. The U.S. Geological Survey studied the surface and groundwater systems in the basin, and assessed the sources and volume of groundwater discharging into the perennial reaches of the Amargosa Wild and Scenic River. The springs within the Tecopa basin (and the greater Lower Amargosa Valley Hydrographic Area) can be generally grouped by spring type and geographic location. There are four types of groundwater discharge points in the Tecopa basin—regional carbonate-rock springs and seeps, Tecopa Hills springs and seeps, thermal springs and seeps, and Amargosa Canyon hillslope springs and seeps. Results of chemical analysis indicate that water from all of these springs in the Lower Amargosa Valley and particularly in the Tecopa basin, is sourced in the carbonate-rock aquifer, with a local component of recharge. Groundwater is recharged in the Spring Mountains and moves through and around the Nopah and Resting Spring Ranges and into the Tecopa basin. A small (less than 1 cubic foot per second [ft3/s] or 500 acre‑feet per year) component of flow from the Amargosa Desert moves through the river channel alluvium and basin fill from the north. The location and type of spring appear to be controlled by the geology and geologic structure of the Lower Amargosa Valley. The regional springs (such as Shoshone and Borax Springs) and associated seeps tend to occur along the west side of the basin whereas other carbonate-rock aquifer springs discharge from adjacent mountain ranges, such as the Resting Spring Range, and as a result of low-permeability barriers, such as the Tecopa Hills. The thermal springs and seeps discharge from an area near the town of Tecopa, California. The Amargosa Canyon hillslope springs and seeps discharge directly into the river. Salt-crusted soils adjacent to the river indicate additional areas of diffuse discharge where groundwater is being evaporated. Perennial flow in the main channel of the Amargosa River appears to originate in an area of thermal springs near Tecopa. Persistent groundwater-fed pools begin to appear along the river channel just to the south of the Tecopa Hills. Flow between these pools is evident, but difficult to measure. During the synoptic seepage measurement survey in February 2014, flow in the Amargosa River at the Tecopa streamgage (U.S. Geological Survey site 10251300, Amargosa River at Tecopa, California) was approximately 1 ft3/s. Just to the south of the Tecopa streamgage, a line of cooler water springs (the Amargosa Canyon hillslope springs) emerges east of the river channel and continues for approximately 1 mile along the Amargosa Canyon wall. At the end of the spring reach, the flow in the river increased to just over 4 ft3/s. Flow then decreased to approximately 3 ft3/s at the confluence of Willow Creek, approximately 3.5 miles downstream. Downstream from the confluence of Willow Creek, the river consistently loses water and was dry just north of Dumont Dunes during the February 2014 synoptic seepage measurement survey.